The expert's travel guide to mountain biking in Europe. Only on iPad. Join renowned mountain bike photographer Victor Lucas as he explores his favourite cycling destinations in Europe. Travel on a journey across nine different countries including Spain, France and Switzerland. Read Victor's descriptions of the trails, the landscapes and local facilities while savouring over 250 images from his personal collection. 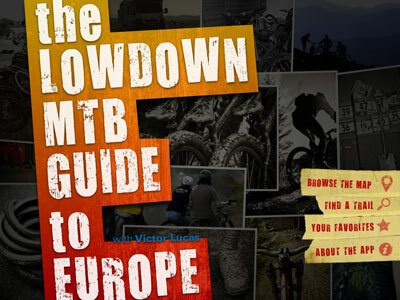 Lowdown MTB is the mountain biking app built by riders for riders. 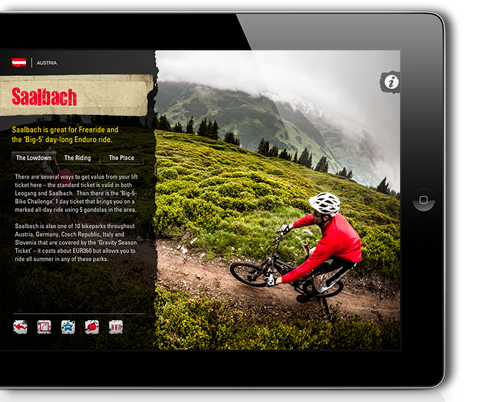 Expert opinions and stunning imagery give you the perfect interactive guide to mountain biking in Europe. Whether you're a hardened racer or simply planning your next family holiday, Lowdown MTB has something for everyone to enjoy. Read Victor's personal opinion of his favourite trails from Ireland, France, Germany, Andora, Switzerland, Austria, Spain, Italy and United Kingdom. Over the years, Victor has ridden and photographed hundreds of trails throughout Europe. From world championship tracks to hidden mountain passes, he's seen them all. Use the Lowdown interactive map to seek out his favourites no matter how 'official'. 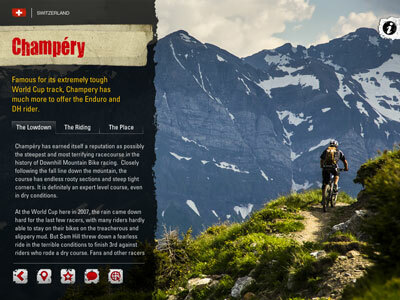 With over 10 full-screen images for each location Lowdown MTB gives you the perfect preview of every trail, from the terrain type through to the stunning scenery. 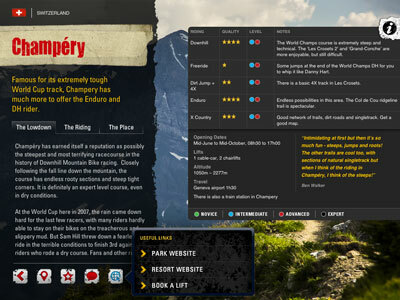 Use the app to select your favourite spots and plan your ideal mountain bike holiday in advance. Dynamic weblinks give you direct access to official trail websites and local facilities where available. From the hardened Enduro racer to the novice cross country rider, Lowdown MTB has something for everyone: Downhill, Enduro, 4X, Freeride and X-Country. At a glance info including trail types, difficulty levels, opening times and lift facilities gives you all the information you need.